21-Feb-2016 -- Now this is interesting. I had seen degree confluence points swallowed up by ‘urban sprawl’ in the US, but it was a bit surprising to see this happen in a sparsely populated country like Australia - especially outside the large cities. 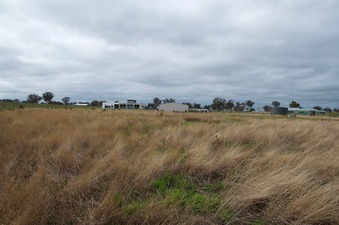 But here it is - a degree confluence point that used to lie in farmland, but now lies within a subdivision being built on the edge of the small town of Murrumbateman, north of Canberra. The point itself lies in the middle of a grassy field that is currently unoccupied, but which appears to be one of the lots at the edge of a subdivision, so a house may end up being built there sometime soon. A recently-built road - Jiparu Road - ends just 90 m from the point. A couple of new bus stops have been built there - so it should someday be possible to successfully visit this point by bus.